I am so excited it’s September! I cannot wait for fall to official start (this week! EEK!). For whatever reason, I am looking forward to it with much more anticipation than usual (possibly because it’s still in the mid 80s here)… that or I just forgot how excited I get every year. 😊 I usually force myself to wait until October 1st to decorate, but I couldn’t wait that long this year. All my fall decorations from the past have been taken from the attic and lovingly placed around my home. But, I must say they are a bit sparse. I love all things fall, so I want more! Full disclosure: I recently did something I said I wouldn’t do… I downloaded the Pinterest app on my phone. I always said I wouldn’t get it because I always hear people say how much time they waste on it. I didn’t even have an account! If I wanted to look for a craft idea or crochet pattern, I would use my husband’s account (yes, he has one… it’s pretty much full of crazy expensive cars and techy stuff… and now my stuff I guess because I still didn’t get an account. lol). Well guess what! I’m falling into the trap. It’s crazy addicting. I think it has put me in the fall decorating spirit even more. So many ideas! I want to do them all! You might be seeing some Pinterest fail pictures coming up the next few weeks. Haha! Honestly though, I LOVE crafting. And this time of year, it seems, the craft stores are having extra good coupons and sales! So, with my wonderful husband’s permission, I have purchased some supplies and set my fall decoration crafts in motion. Some projects I have been wanting to do for several years and kept putting them off because I didn’t want to spend money on something so “frivolous.” But I am finding that a happy, comfortable home is important. And when I am happy with the way my home looks and feels, I am more willing to do those not-so-fun chores that are needed to keep it that way. Today I wanted to show you a quick glimpse into my crafting excitement and some of the projects I’m working on. Then in the next few weeks I’ll show you each of the projects as they are completed (including a handy-man husband project that I’m super excited to share, provided all goes according to plan) as well as my finished fall decorations for the year… a “fall house walk through” I believe they call it. There’s so much potential in this mess! 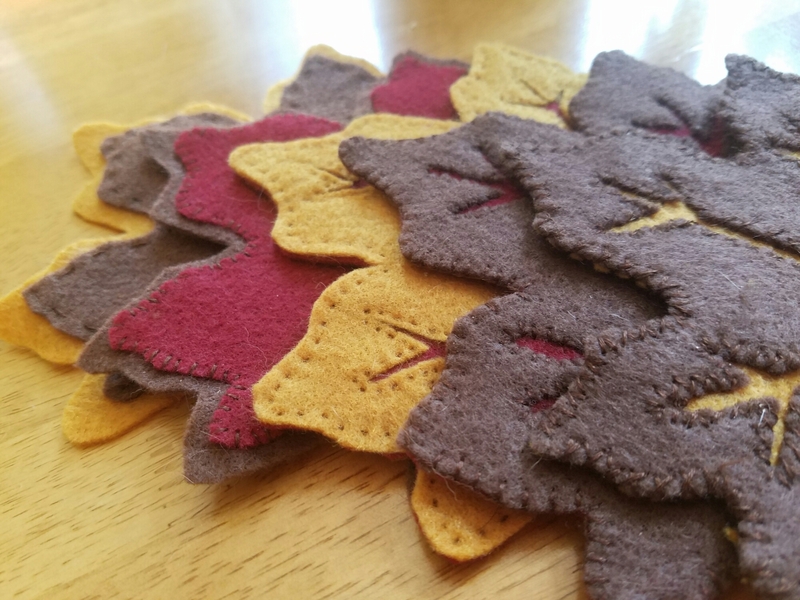 And the first project to actually be completed: Fall Leaf Coasters! Don’t you love those adorable salt and pepper shakers I got from Cracker Barrel a few years ago! This is where I found the tutorial and template (from Pinterest, of course). I did tweak it some because I wanted to add some character. You may find that, although I do tend to like straight lines and be a little bit (okay, a lot a bit) OCD about things like that, I don’t like everything to be exactly the same. 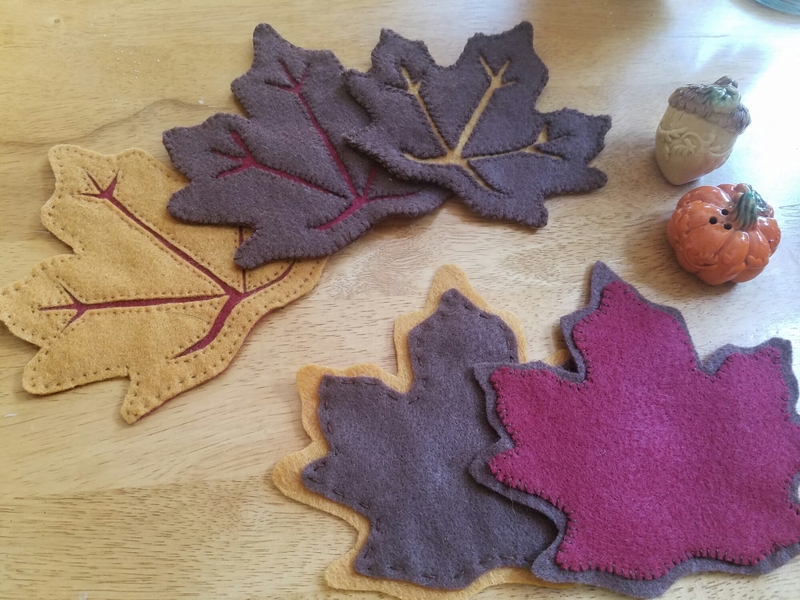 So instead of using the same stitch for all of my leaves I tried to make the stitching on each leaf unique. And I didn’t pay attention to whether the stitches were evenly spaced or not because I kind of liked the whimsical unevenness (and I’m impatient). 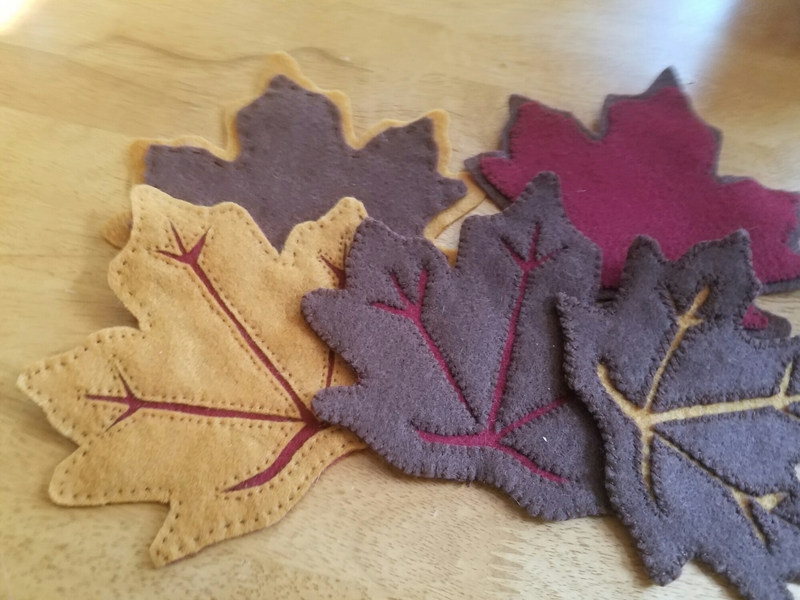 These did take a bit longer to complete than I originally anticipated, simply because I was going to machine stitch them but decided to hand stitch instead. 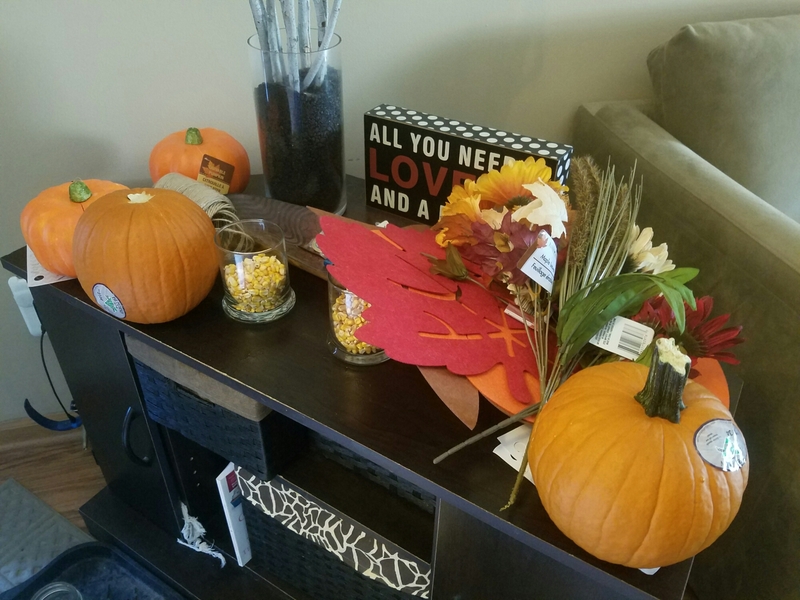 A simple, fun way to add some gorgeous fall color to your home, and it’s a project you could easily do with the kids! Enjoy! Previous Post School Is in Session!